Maria Goeppert-Mayer was only the second woman to receive the Nobel Prize, and the first to receive it for achievements in the area of theoretical physics. She was awarded the Nobel Prize in 1963 jointly with J. Hans D. Jensen and Eugen Wigner “for their discoveries concerning nuclear shell structure”. Goeppert-Mayer and Jensen had reached the same result completely independently of each other. The third Laureate, Eugen Wigner, provided the theoretical basis for their insights. Their scientific achievements predated the awarding of the Nobel Prize by a number of years, however. Maria Goeppert-Mayer’s pioneering breakthrough came in 1949 when she was 43 years old. 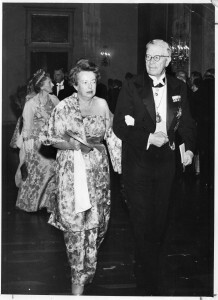 From 1955, she received a total of 27 nominations for the Nobel Prize, among others from Max Born, himself a Nobel Laureate and an important mentor for Maria Goeppert-Mayer. Max Born and his fellow Nobel Laureates James Franck and Adolf Otto Reinhold Windaus were already members of the examination commission in Göttingen when Goeppert-Mayer completed her doctorate in 1930. 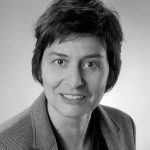 Eugen Wigner is reported as having described her doctoral thesis as a “masterpiece of clarity and concreteness”. The fact that the first nominations arose in 1955 was no coincidence. This was the year that Goeppert-Mayer and Jensen jointly published their “Elementary Theory of Nuclear Shell Structure”, which went on to become a standard work. This had been preceded by Goeppert-Mayer’s individual publications “On closed shells in nuclei” and “Nuclear configurations in the spin-orbit coupling model”. What was the scientific conundrum that Goeppert-Mayer resolved so successfully? The structure of the atomic nucleus had not yet been clarified in 1948. The mystery behind the magic numbers associated with the atomic nucleus, which had been given this name by Eugen Wigner, had not been solved either. In nuclear physics, certain numbers of neutrons and protons in the atomic nucleus are referred to as magic numbers. These numbers are associated with greater stability in the basic state of the nucleus than that observed in neighbouring nuclides (on the nuclide map). Elements have a nuclear charge resulting from the presence of a particular number of positively charged protons. The number of uncharged neutrons in the atomic nucleus can also vary. All of these variants of one and the same element are called isotopes. A stable isotope does not change and retains the same number of protons and neutrons. It had already been established in previous experiments that stable nuclei have exactly 2, 8, 20, 28, 50, 82 and 126 protons or neutrons. That is why they received the designation magic numbers. Therefore, the question arose: What makes the nuclei with these magic numbers so stable? Maria Goeppert-Mayer discovered that protons and neutrons rotate and simultaneously move in orbits around the atomic nucleus. They are comparable to the Earth, which turns on its own axis while moving in its orbit around the Sun. For optimum stability, the first orbit should contain 2 particles, the second 8, the third 20 and so on. The magic numbers thus represent the point at which the different orbits are filled. Maria Goeppert-Mayer’s idea of comparing the orbits inside the atomic nucleus with an onion, which consists of multiple layers but is empty inside, prompted Nobel Laureate and fellow physicist Wolfgang Pauli to nickname her “The Onion Madonna”. In addition to the magic numbers, another important effect known as spin-orbit coupling also had to be taken into consideration. This concept refers to the shifts in energy that arise depending on whether an electron rotates with or against the direction of rotation. The corresponding effect in electrons is weak – but what is the impact within the nucleus? Goeppert-Mayer’s ‘Eureka’ moment arose when, contrary to the assumption that this effect is as weak in the nucleus as it is in the electrons, she inverted the hypothesis and carried out calculations based on the assumption of strong spin-orbit coupling in the nucleus. She herself later referred to it as the final piece in the puzzle – Enrico Fermi, the 1938 Nobel Laureate in physics and Goeppert-Mayer’s most important sounding board at the time, was an ‘ear witness’ to this particular moment of inspiration. Thanks to the theory developed by Goeppert-Mayer, it was not only possible to reconcile a large number of known behaviours of atomic nuclei under one heading, but also to make predictions. 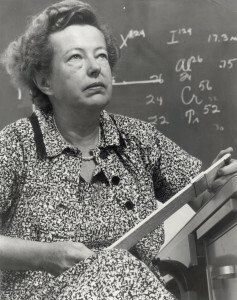 Maria Goeppert-Mayer then went public with her scientific explanation of how the ‘magic numbers’ came about – based on the assumption of the strong spin-orbit coupling of the nucleons. The fact that Jensen and Goeppert-Mayer did not become embroiled in a dispute about precedence but, on the contrary, worked together on a project from 1950, was a noble gesture on both their parts – and, alas, a far from common one. What was even more gratifying was that all of the contributors were in a position to accept the Nobel Prize in mutual amicable agreement. However, the road to this point for Maria Goeppert-Mayer had been rather different to that of her male colleagues: She was only appointed to her first paid position as a professor at the University of California in San Diego three years before being awarded the Nobel Prize – at the age of 54! Maria Göppert was born in Kattowice (part of Silesia, Germany, at the time and today in Poland) in 1906. Her parents soon moved to Göttingen with their young daughter. She initially attended the Göttingen-based Luisenschule, a private girls’ secondary school, and continued her school education at an institution run by the Verein für Frauenbildung-Frauenstudium (“Association for Women’s Education and Study”). There, she attended university preparatory courses and at the age of seventeen she passed the German Abitur examination on 4 April 1924 along with three other girls and 30 boys. Fortunately for this very talented young girl, both of her parents were keen to foster her development in every way. Her father, a professor of paediatrics, and her mother, a qualified French teacher, also had an inspirational circle of friends. There was never any doubt that their daughter would go to university. Thus, Maria Goeppert-Mayer registered for a course of study in mathematics at the University of Göttingen but transferred to physics after three years, as Max Born, Werner Heisenberg and Pascual Jordan, who taught there at the time, had kindled her interest in quantum physics. Shortly before completing her doctorate she married the American chemist Joseph Mayer and accompanied him to America after her doctoral examination. It was there that she adapted her German name from Göppert to Goeppert. Reportedly, she had hoped that it would be easier for female scientists to make headway in the research environment in the USA. Instead, however, the young couple found themselves in a country mired in an economic depression and, as the mere ‘wife of a professor’, she was unable to get an academic appointment. She therefore continued to conduct unpaid research and teaching; physical chemistry was her main focus of interest at the time. Together with her husband, she published a textbook entitled Statistical Mechanics. Her two children, Maria Ann and Peter Conrad, were also born during this period. Having worked at various other universities and research institutions, in 1946 the Mayers found themselves in the right place at the right time again in Chicago. Chicago was akin to Göttingen 20 years earlier – a centre that attracted the most renowned scientists of the period. Goeppert-Mayer was given a professorship in Chicago – albeit unpaid, yet again. Nevertheless, this period was crucial for her in terms of her scientific development. She continued to delight in research and her perseverance finally paid off. Another move finally enabled her to fulfil her career ambition: the University of California, San Diego, which was founded in 1960, can take pride in the fact that such a progressive ‘dual-career couple’ already held tenured positions there when the Nobel Prize was announced. And Maria Goeppert-Mayer proudly wrote in the autobiographical notes for the Nobel Committee that she had continued the family tradition by becoming a professor in the seventh-generation. 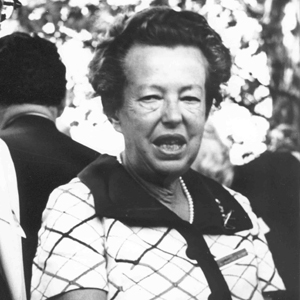 Maria Goeppert-Mayer died in San Diego on 20 February 1972.